LIBERTYAIR Air Conditioning and Heating services all of Alachua County, Florida, and surrounding areas with A/C and heating service. Our commitment to our customers is to be the best air conditioning and heating service provider in Gainesville. From our quick response time and convenient scheduling to our courteous staff and experienced technicians, we strive to provide you with quality installation, maintenance and repairs every time. We love serving the Gainesville and greater North Central Florida region because of the strong sense of community. That's also why our customers feel as though they are a part of our growing family. Call us if you are experiencing problems with your heating, ventilation and air conditioning equipment, even if another company has installed or serviced the equipment in the past. Our technicians are knowledgeable of all the top-name brands as well as many of the other systems used and loved by Gainesville residents. 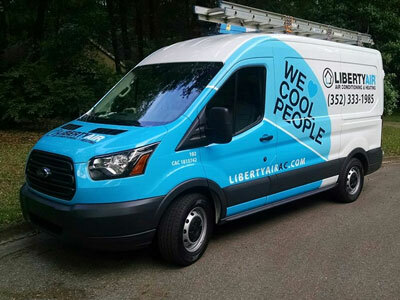 If your A/C or heater stops working, call LIBERTYAIR for fast and reliable service.